The Story: Princess Penelope’s parents are busy so she decides to play with a kitten but he has other ideas. The kitten takes the end of a ball of wool and runs off leaving a trail around the palace. Princess Penelope chases him and follows the woolly trail out into the garden and back through the kitchen. When she finally finds the kitten he is fast asleep and cuddled up with his mum. Princess Penelope’s mum is knitting and it is her wool that forms the tactile, glittery pink trail that the mischievous kitten leaves as he looks for his mum. He causes chaos in the palace, thrones are left tangled in wool, pots and pans get tangled up in the kitchen and the parlour maid drops the cakes, My daughter loves following the raised trail. It takes a while for her to run her finger over each page, especially up and down the stairs and around the poor soldier who ends up tied to a pillar. 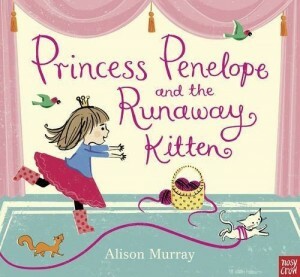 As Princess Penelope and Doggy (a corgi) follow the kitten’s trail they are joined by a variety of animals including the birds that escape from their cage and a peacock and a squirrel in the garden. The rhyming text bounces along and the easy to read font is good for a beginner reader. Each double page spread has bold, colourful illustrations and the kitten is shown on the right of the spread with pictorial clues showing where he is going next, I particularly like the vegetable garden and the maze. Princess Penelope is a modern princess, she is dressed in a tutu style skirt which is teamed up with an adorable pair of pink spotty boots. It’s the look my daughter favoured when she was younger. Princess Penelope and The Runaway Kitten is a great first picture book for little readers who are starting to enjoy simple stories. The action keeps them turning the pages and also provides scope for ‘what do you think will happen next?’ discussions.